Thanks much! I'll try out this code as soon as I can. I know I should post when I do so, but it seems I can't edit what I've previously posted, and I wanted to say the heart issue has been fixed. So, thanks for taking the time to answer. I am, however, still stuck. Somehow it only draws the line on top of the track titles, rather than actually affecting the size of the group. Really hope to get this resolved, and thanks again for bearing with me. From what I gather from your code and screenshots the problem here is the fact that the cover is drawn both in the track list and the group header. The group header shows the top part and the rest is filled up with the cover drawn in the tracklist. Neat but it gets you into trouble with the rows in the tracklist of course. It seems to show the lower part of the cover in the tracklist a certain minimum amount of rows need to be present (each row is one track). 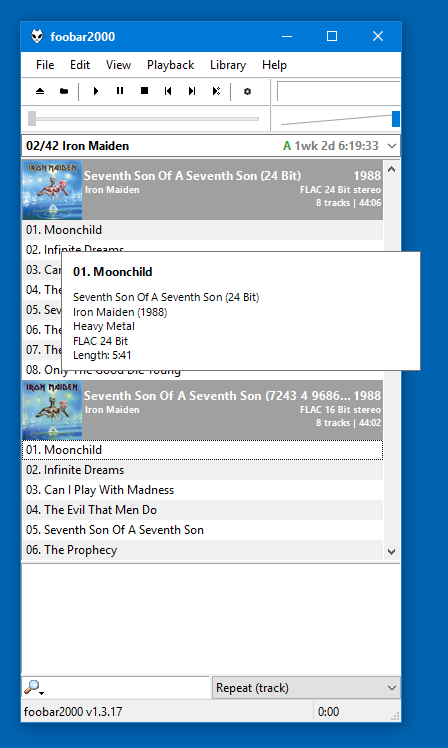 If not enough rows are present then the cover in the tracklist gets cut off at the bottom. Minimum row number of group is the part you need to look at. Of course you'd only want to add x amount of enough rows only when it's necessary when the group doesn't have enough rows otherwise empty rows will be added to every group. How nice! I think the problem has been fixed for the most part. The way it was fixed lies in what you said about that first code. (the numbers I played around being "7" and "8"). I say mostly fixed because sometimes, certain groups have uneven space. It doesn't happen much, and it's rather random, but it's there. I don't really understand what the code is doing for it to go away, so I tried many numbers (even changing the resting "1"), but I haven't gotten into a combination that doesn't do it. Do you have any idea why it happens? Not sure what the value of X/Y would be, but it would just be a matter of testing it out. I didn't find a $iflesser function so I'm not sure if this is doable, though. Regardless, as it is now it works great 90% of the time so if this isn't doable that's okay too. Again, thanks very very much to both of you. Really. This has been a pain to get right, and I couldn't have gotten nearly as far if it weren't for you. $ifgreater(A,B,C,D) If the number A is greater than the number B, executes/returns C, otherwise executes/returns D.
Why would you need a $lesser function? If D executes anything that's not greater than A. But it seems you need a minimum of 8 rows. So instead perhaps you should try $ifequal. So if %el_direct_item_count% is 1 then add 7, if it's 2 then add 6 and so on until you end with 8. You'll probably need to put this into one single line. However, %filesize% is only related to the selected track, so it shows different numbers every time I select another track. Any way to find out the size of all the el_items in the playlist? Group header is where you show totals and only for the grouping format and only with available ELplaylist custom fields such as %el_item_count% (counts items within group), %el_sum_length% (length of items within group). There is no custom sum filesize as far as I'm aware. But even if it were available you'd need to put the entire playlist within one group format which kinda negates the usefulness of ELplaylist. Also, I believe there's a jscript panel playlist organizer script out there that can probably do the same. Not sure about that one since I'm not using it. I find some solution. 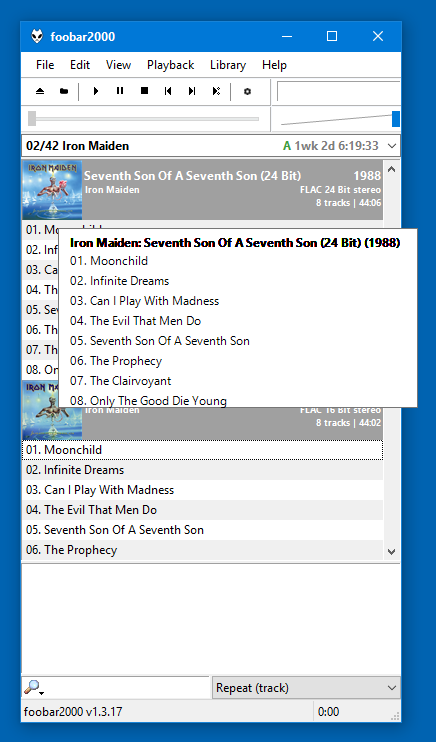 Not by ELP but with playlist switcher. I've modified a bit the default theme through lots of trial and error and have found something I can't explain. This shows the lightly modded default popup when the mouse is over a track and the whole code after the comma when over a group header. Everything is ok except that the text drawn by the 3rd code line starting from the bottom renders ugly. "aa" and "hq" options for $drawstring don't improve it. As you can see, the first line renders ugly. It this a bug? Is there any rational explanation? I see there was an answer a page or 2 ago but the image hosting isn't working. Does anyone know if it's possible to force ELplaylist not to expand groups? In other words, when selecting the group header to keep the group locked. New to ELplaylist, sorry for a dumb question. Is there a way to set color to a particular text string, like $rgb() function in NG playlist? I'm guessing the a in rgba stands for "alpha" which is the transparency setting (set 0 to 255). Not sure, I usually use $drawtext which doesn't have that option. I've seen that one, but it seems to put the string at specific coordinates, which is pretty inconvenient. Without coordinates, how would you imagine ELplaylist to know where to draw text? Like in NG playlist, for instance, starting after the last bit of text. But I guess that's not how ELplaylist operates.